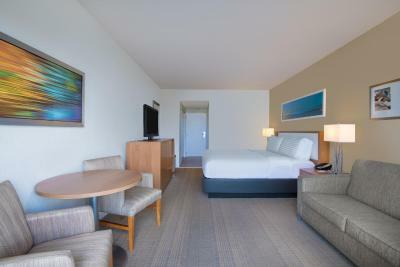 Lock in a great price for Holiday Inn Resort Aruba - Beach Resort & Casino - rated 8.2 by recent guests. The location on the beach was excellent and the pool area (we used the pool by ocean tower) was perfect for small children. Christmas meal in the sea breeze restaurant was really good, with beautiful views of the sun set and out to sea. Breakfast was good and a wide selection. Pools and outdoor area kept clean. Beach was clean and direct access from the hotel. Staff were all pleasant. Direct access to one of Aruba's best beaches. The Jamaican lady on the towel booth was the best employee from the whole hotel. The rooms are nice and clean. The beach is beautiful and the weather is always sunny and hot ! It's a brilliant located resort.Wide range for eating in the hotel and the surrounding area as well.Room was very tidy.Staff it's OK helpful if we needed.Lots of entertainments and activities. This property is ideally located near the middle of Palm Beach and across the street from a nice market place. We visited restaurants and casino's in the nearby resorts and had a look at their room rates to compare prices. The Holiday Inn Aruba is a good bargain for the price. We ate at Corals and the Seabreeze and the food was decent. The quality and prices are comparable to the other restaurants nearby. The property is really pretty - we loved hanging out in the hammocks in the Palm Tower courtyard and being so close to the beach. On day three we discovered a leaky pipe in the bathroom and when we reported it the on duty manager moved us immediately to another room and gave us a free night for our troubles. If you are going for an extended stay there is a laundry room on the 7th floor in the Palm tower that was really clean and the machines worked well. The position of the hotel was good. The ocean view was great. I liked the beach and pool areas. It was a buzzing place with heaps of atmosphere. The hotel was centrally located to other outside restaurants and shopping stores. Everynight the hotel offered a different dining experience and even entertainment. We would highly recommend this hotel to any friends. Location is great, next to all restaurants and amazing beach. One of our top picks in Palm-Eagle Beach.Set directly on the beach in Palm Beach, Holiday Inn Resort Aruba - Beach Resort & Casino features 3 swimming pools, 4 restaurants, a casino and live nightly entertainment. Free WiFi throughout is available. 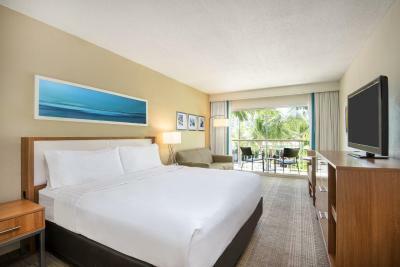 Start the day at the Holiday Inn Resort Aruba with a cup of coffee from in-room coffeemakers and enjoy beautiful views from private balconies or patios. You can also take advantage of the 24-hour fitness centre. Top-rated golf courses, scenic horse riding trails and exceptional shopping centres can be found within a short distance of the Aruba Holiday Inn - Beach Resort & Casino. Holiday Inn Resort Aruba - Beach Resort & Casino has been welcoming Booking.com guests since 4 Nov 2009. This suite features a flat-screen TV, tea/coffee maker and air conditioning. House rules Holiday Inn Resort Aruba - Beach Resort & Casino takes special requests - add in the next step! Extra beds are available on request. Please note that all extra beds are rollaway beds.